This entry was posted in Photos, Rice by Annie. Bookmark the permalink. I blogged on risotto too, but only AFTER I spent many hours stirring, stirring and going stirring crazy to perfect this awesome dish. Cooks Illustrated’s method works for me, but I have two hungry guys to feed so quantity is A-Ok in my house. Keep at it, it truly is one of those culinary delights that does need to be mastered. And keep that kimchi hidden! Kate: I love CI, and will definitely try their method, thanks! The risotto mnemonic that I’ve seen oft-repeated is 1, 3, 2: 1 cup dry rice with 3 cups hot stock/cooking liquid/what have you with yield 2 cups of cooked rice. It’s worked for me, and I use it a lot to adapt risotto recipes for 1/2 cup dry rice. Risotto does have to be babied and fussed over, and I’ve found that when I’m making extra-small amounts I need to have the heat lower and not over-whelm the rice at any point with the stock. There are a couple of methods, including Alton Brown’s, I think, that have you add a bunch of stock at once and then let it simmer, rather than the “add, stir stir stir, add” that’s traditional. I tried that once, but the rice cooked to al dente before all of the stock had absorbed and by the time the excess cooked off the dish was mushy and disappointing. When you’re cooking a whole cauldron of risotto I bet it works a treat, but I’ve had little luck with it on solo-portions. Best of luck! 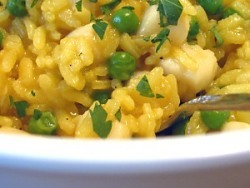 Risotto is one my all-time favorite dishes to cook; I hope you get to have as much fun with it as I do. different Kate: Thanks for the advice! I was just about to try again after I bought some dried porcinis. I will definitely keep all your advice in mind. I personally like the fussing and stirring—it makes me feel accomplished, lol.